The Portuguese visited Timor in the early 16th century and were the first Europeans to establish themselves in Timor, at Lifau in what is now Ambeno in 1556. Their claim to the island was disputed by the Dutch, who arrived in 1613. By a treaty of 1859, modified in 1893 and finally made effective in 1914, the border between the Dutch and Portuguese territories was settled. The colonial powers exploited the island's sandalwood, which was largely exhausted by the early 1900s. In World War II, Timor was occupied (early 1942) by the Japanese. In 1950, Dutch Timor and the rest of the surrounding Dutch East Indies became the Republic of Indonesia. In 1975, when Portugal's former colonies were being granted independence, fighting broke out between rival independence parties in Portuguese Timor. The leftist Revolutionary Front for an Independent East Timor (FRETILIN) triumphed, and on November 28th FRETILIN established the Democratic Republic of East Timor, with Francisco Xavier do Amaral as its president. Nine days later, Indonesia invaded and claimed sovereignty, administering the area as Timor Timur province, but the annexation was not accepted internationally. The population was decimated by food shortages, disease, and military violence, with perhaps as many as 120,000 people dying by 1979. Sporadic warfare with FRETILIN guerrillas continued, and in Aug., 1998, Indonesia and Portugal reached an agreement that would give East Timor the right to local self-government. Indonesia was reluctant to withdraw its forces, however, and talks broke down. 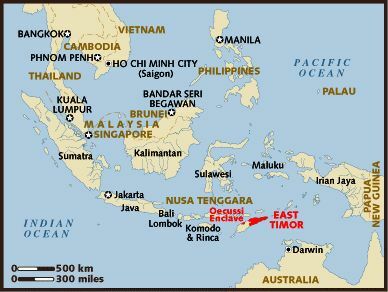 In Mar., 1999, Portugal and Indonesia agreed to let the East Timorese choose between autonomy within Indonesia or independence. Indonesia expected to win ratification of its rule, but in August, in a UN-supervised referendum, voters chose independence. The territory descended into chaos as pro-Indonesian militias and the army engaged in a campaign of terror and brutality, killing supporters of independence, looting and burning buildings, and causing thousands to flee their homes. In September, after intense international pressure, Indonesia asked the United Nations to send a peacekeeping force to East Timor. In October, the United Nations agreed to assume the administration and defense of East Timor, which became a non-self-governing territory. Although Indonesia tried some officials and security personnel in connection with the violence, all ultimately were acquitted or had their convictions overturned. A constituent assembly, charged with writing a constitution for East Timor, was elected in Sept., 2001. In Apr., 2002, José Alexandre "Xanana" Gusmão (later known as Kay Rala Xanana Gusmão), a former guerrilla leader, defeated Xavier do Amaral for the presidency, and the following month East Timor became an independent nation. FRETILIN won a majority of seats in the parliament, and Mari Alkatiri became prime minister. An agreement resolving most border issues was signed with Indonesia in 2005; peacekeeping forces were withdrawn the same year. Timor Leste occupies the eastern half of Timor Island, the exclave of Ambeno (or Oecussi) on the northwest coast of Timor, and offshore islands. Dili, on the north coast, is the capital and largest city, as well as the country’s main port. Other large cities include Dare, outside Dili, and Baucau, the site of the main airport, on the northeast coast. The terrain is largely hilly and mountainous, reaching its highest point on Mt. Tatamailau (6,562 ft/2,963 m). A large remnant of tropical forest at the E tip of Timor Island is a National Park. The inhabitants are predominantly of Malay, Polynesian, and Papuan descent; there is a Chinese minority. The vast majority of the people are Roman Catholic, and there are small numbers of Muslims and Protestants. Portuguese and Tetum, the main local language, are official languages. Although Portuguese is no longer widely spoken since independence, it has been reintroduced into the government, courts, and schools. English and Bahasa Indonesia are "working languages," and there are around 16 indigenous languages. According to the Constitution of the Democratic Republic of East Timor (Timor-Leste), the yellow triangle represents "the traces of colonialism in East Timor's History"; the black triangle represents "the obscurantism that needs to be overcome"; the red base of the flag represents "the struggle for national liberation"; whilst the star, or "the light that guides", is white to represent peace. The East Timor flag was adopted on May 20, 2002, making it one of the world's newest flags. It is the same flag that was used from 1975 to 1979. East Timor declared independence from Portugal on November 28, 1975. Indonesia then invaded in 1976 and occupied East Timor for the next 24 years. Wars followed, and East Timor regained independence in 2002. The old flag was then readopted. 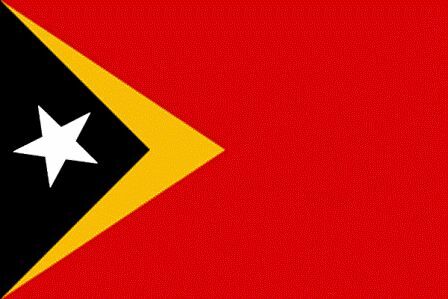 Timor Leste is the country's official Portuguese name.